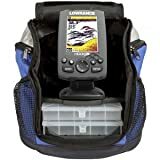 A kit like the Lowrance 000-11673-001 Elite-3X All Season Portable Pack, anyone can get into fishing because of how affordable it is. It doesn’t matter what type of fishing you’re into, whether you like cruising around the waters or just stationary at one place, the Elite-3x has your back. When it comes to fishing, most people don’t have the slightest clue on where to start. But when you’re in 2017 you know there’s always a gadget to make things less troublesome, that includes fishing! Presenting, the Lowrance Elite-3X All Season Portable Pack, to suit all your 21st-century fish finding needs. It comes with an easy to carry portable sonar unit featuring a Skimmer® transducer with suction-cup mount for convenience. This device is even usable for ice fishing due to the dock/ice transducer & mount for vertical, stationary fishing tactics. You will absolutely love this product. The Lowrance Elite-3X Fish Finder has a medium sized 3.5-inch screen with a 256-color display. It has a resolution of 320 x 240. You can clearly view the LED screen even under the sun; it also features night operation. This device has a broadband sounder which easily identifies the smallest details like fish targets, bottom contour, structure detail, bottom hardness, thermoclines, etc. It also has 2 Sonar frequencies: 83kHz or 200kHz. This maximizes the view underwater. The 83kHz frequency provides a conical coverage of 60 degrees which is perfect for viewing largest fish arches and searching large areas. The 200kHz, on the other hand, is good for drop-shotting technique. The Lowrance Elite-3X features a skimmer transducer with built-in water temperature sensor. It can track the bottom up to 75mph. To identify fish targets, the device will show fish arches. If you turn on the Fish ID feature, it will show fish icons instead. You can also zoom in up to 4 times and focus on the key fishing areas. You don’t need to manually adjust the settings because this instrument provides the Advanced Signal Processing system. To adjust the brightness, you can repeatedly press the power button. It does everything its suppose to (i.e find fish!). It is extremely user-friendly and has a light weight. For the price, this is a great gadget to have for that 21st-century fishing! Hurry up and get your very own fish finder by Lowrance before it runs out of stock.